I'm sure people like Rajiv Malhotra and RSS zealots had no intention of spreading the writings of Wendy Doniger, but that's precisely what they've done. I don't judge anyone without first understanding their position. When fools like RSS start smearing people, I am very suspicious, because I know how shallow is their intelligence and knowledge. So I had no comment re: Wendy Doniger's actual work during the Doniger book pulping controversy – because I had NEVER EVEN HEARD OF HER! I'm not much into religion or history so unless you point out a particular issue, I'm likely to never even think about it. I don't go out of the way (as I did when I was much younger) to buy books on religion/ history. Now that Hindutva fanatics have introduced me to her, however, I was curious. I've since then had a quick look through the early parts of The Hindus: An Alternative History. Yesterday, I also listened to Doniger's recent lecture uploaded by the University of Chicago. It turns out that Doniger is good. Very good. She has spent nearly 50 years studying Hinduism and India, and has many interesting insights to offer – in an extremely scholarly and dispassionate way. I'm surprised why Hindutva fanatics are upset by her work, since she has a rather favourable attitude towards Hinduism. She acknowledges that Hinduism is remarkably tolerant. She also shows other religious (like Christianity and Islam) have failed to dent Hinduism; perhaps because it offers to its adherents a structured flexibility that other religions can't, or don't. Very insightful and scholarly is how I'd rate Wendy Doniger. She points out also how American IT-literate Hindus (who dominate the internet and Wikipedia) have started insisting over the last 10 years that only THEIR version of Hinduism is right. I commend her works to everyone. Read it, if only to open your eyes and get a different, scholarly perspective. When I read or hear Rajiv Malhotra I get a sense that I'm reading/listening to a bigot (which he is, without any doubt). When I read/ listen to Doniger, on the other hand, I get the sense that I'm going to learn something through rational discourse. With the use of subtle humour, her work is also extremely readable. I appreciate the place in the talk where Doniger suggests that scholars of religion, like scientists, merely make their best attempt to interpret things – thereby being open to other opinions and interpretations. ("Our best guess is this"). Unlike them, however, deeply ignorant bigots like Malhotra see the world in only one way – and their way is often plain wrong. I've got too many other non-historical/religious priorities and so might not finish reading Doniger's work, but if you've bot a moment, do read her and let me know what you think. Sanjeev Sabhlok ‎"Caste system is present not just in Hinduism but also Christians, Muslims, Sikhs etc." Let's assume this were true. Does it mean that if a fool jumps in a well, you too should follow the fool? The point is this caste thing is the GREATEST blight on mankind today. It is intolerable that Hinduism has a caste system. It is discriminatory and offensive at all levels. Sanjeev Sabhlok Dear GS re: "I strongly object to you calling hindus racists and against liberty. that is something that can be avoided". I'm afraid the truth must be spoken. There are many Hindus who are AGAINST caste system and in favour of liberty. But those who want to exploit the caste system for their personal gain are opposed to changing it. They also oppress the "Dalits". You keep saying (very incorrectly, I may add, but I'll not debate that), that "Caste system is not a product of Hinduism alone and I am not sure how it came up in the first place…but some kind of factions and divisions are present in all societies." The truth is that the caste system with its most obnoxious and hideous discrimination is ONLY found in Hinduism. Social inequality is found everywhere but has never been institutionalised to the extent found in Hinduism. Please don't quote me the Gita or Vedas. I care for the truth that prevails TODAY. And the truth is very ugly. The sooner you admit it, and start a battle against this evil, you will help India's growth as a free nation. When 30 per cent of India's population is treated almost on par with slaves, India can't become free. Why can’t Muslims and Christians enter Hindu temples? Why can't they enter if they have no faith in Hinduism? There is nothing preventing ANYONE from entering a Church or mosque. So why this condition in Hinduism that you can enter a temple ONLY if you have faith in Hinduism? Can a Christian attend a mosque? Mosque is the House of Al-Mighty God Allah Subhanahu Wata'ala. Every mankind are slave of God. Every mankind have the right to be in God's House. During Prophet and Apostle of Al-Mighty God Allah Subhanahu Wata'ala Prophet Muhammad Sallallahu'alaihi Wassalam All meeting with Christians and other religion are done in the Mosque. Indeed, if a religion claims to be tolerant but won't even let non-believers enter its temple, then how can it claim to be tolerant? Pakistanis doing the “RSS special”. Can we all please grow up? BJP/RSS is fond of fiddling with textbooks (particularly history books), largely with the implicit aim of increasing communal hatred among Hindus towards Muslims. Pakistan, too, has been altering textbooks to inflame Muslims sentiments against Hindus. Indeed, Pakistan text books blatantly write about Hindus "as enemies of Islam". "Although an unbiased review of history would show that Hindus and Muslims enjoyed centuries of harmonious co-existence, Hindus are repeatedly described as extremists and eternal enemies of Islam. Hindu culture and society are portrayed as unjust and cruel, while Islam is portrayed as just and peaceful," USCIRF said in its report. Pakistan's public schools and privately-run madrassas are not teaching tolerance but are exacerbating religious differences. I must add that while I was in Los Angeles, my father was invited by a Muslim scholar who teaches comparative religion in one of the minor universities there, to talk about Hinduism. I attended the talk in which the students were first introduced to Hinduism through a totally biased and distorted video. Thereafter my father spoke and largely clarified the meaning of Hinduism and its philosophy. There is a tendency among many people to look very critically at superficial aspects of Hinduism. I'm afraid that approach doesn't do its philosophy justice. Mixing politics with the teaching of history – to distort the rich history of the sub-continent – is deplorable. There are both good and bad points in each religion, and in each nation's history. And no doubt there will be different opinions about what happened in the past. 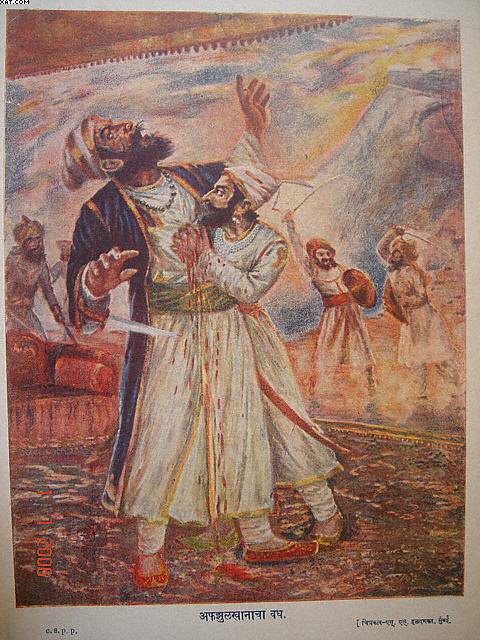 The famous story of Shivaji and Afzal Khan is a classic example. Some think that Shivaji was a "hero". Others perhaps think he was a terrorist. But history books should not make VALUE JUDGEMENTS about such events, merely record them. Teachers must explain that what Shivaji (or Afzal Khan) did does not matter today, in our life. They must emphasise that this incident occurred a LONG time ago, well before India (or Pakistan) became independent. What matters is what we choose to do with our life. Students need to be taught that they as INDIVIDUALS are responsible for their own actions. And merely because something happened in the past doesn't mean it should prompt any "response" from us today. Without such wisdom being imparted, the cycle of hatred and vengeance in the sub-continent will continue. The way out is for both the Islamic and Hindu fanatics to revert to the PHILOSOPHY of their religion, and aim for the good of all mankind.